A team of five students from Emory University School of Law and Georgia Institute of Technology who recently took home sixth place at an international startup competition now hope to market their winning idea — a medical device to prevent a painful and disfiguring disease that affects nearly half of all breast cancer survivors. The team's focus is a diagnostic tool to prevent lymphedema, which causes an abnormal fluid buildup when lymph vessels or nodes are missing, damaged or removed. It would allow patients to regularly monitor themselves to detect swelling, which is critical because the condition is irreversible if not treated early. "The device works by optically measuring lymphatic pressure, like a blood pressure cuff for your lymphatic system," says third-year Emory Law student Robert Jones. "It’s a significant advancement over the current diagnostic gold standard, an ordinary tape measure, which is ineffective at catching the swelling until it becomes permanent." On April 12, the Emory Law-Ga. Tech team placed sixth at the Rice Business Plan Competition, which is billed as the world’s richest and largest such tournament for graduate students. The students' team, named LymphaTech, is part of a collaboration between the two institutions called Technological Innovation: Generating Economic Results, or TI:GER. "It’s the hardest [startup competition] in the country to get into," says Margi Berbari, Ga. Tech’s TI:GER program director. "Not only were they accepted, they won sixth place, best presentation and the Women’s Health Award for a total of $38,000. They’re on a roll." In their pitch, LymphaTech sought $2 million in funding for FDA human clinical trials and a comparative effectiveness study for insurance reimbursement approval. "We’re no longer treating this like a class," Jones says. "We’re focused on further laboratory research, prototype development, securing a license with Georgia Tech and solidifying our FDA trials strategy," he says. "We’re able to fund these initial steps using our competition winnings, and we will continue to seek additional funding." There are only six labs worldwide that perform this type of lymphatic research and none of the other labs have shown interest in commercialization, Jones says. "Also, we’ve faced hurdles in own path to market, and the knowledge and connections we’ve gained while overcoming those definitely give us an advantage going forward," he says. The TI:GER team was chosen for one of 42 slots to present at the Rice competition from more than 500 applications. Teams present over three days, accelerating from a practice round and elevator pitch on Thursday, to semifinal, shark tank and final rounds on Saturday. LymphaTech team members include: third-year Emory Law students Jeff Adams and Robert Jones, and Ga. Tech students Mike Weiler, Nate Frank and Salim Vagh. Adams focuses on contract law and healthcare regulatory practices, and Jones covers patent and intellectual property issues. At Ga. Tech, Weiler is a biomedical engineering PhD student who developed the idea from his work at Ga. Tech’s Laboratory of Lymphatic Biology and Bioengineering; Frank and Vagh are MBA candidates. Team advisors are Amelia Zelnak, assistant professor at Emory School of Medicine; Brandon Dixon, assistant professor of mechanical engineering at Ga. Tech; and Robert McNally, CEO of Cell Dynamics LLC. Administrative professor Anne Rector directs the TI:GER program at Emory Law. 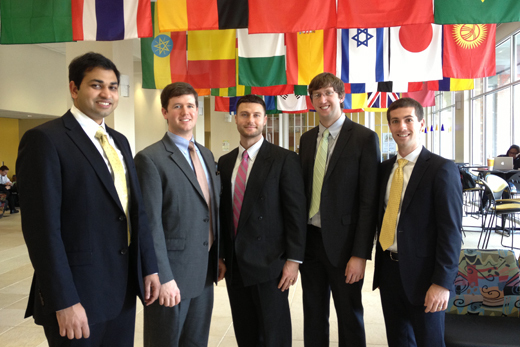 The next stop for the team is the 2014 Global Venture Labs Investment Competition held May 1-3, in Austin, Texas. In 14 years, The Rice Business Plan Competition has grown from nine teams competing for $10,000 in prizes in 2001 to 42 international teams angling for a purse of more than $1.3 million in cash and prizes. "The competition is designed to give collegiate entrepreneurs real-world experience in fine tuning their business plans and elevator pitches to generate funding to successfully commercialize their product," according to the competition site. A majority of the 250 volunteer judges are from the investment sector, and rank teams on which company they would most likely invest in.